Dinesh Karthik's IPL teammate Robin Uthappa feels justice has been done with Karthik's selection in India's World Cup squad. During India's series against Australia, BCCI selectors had dropped Karthik from the squad after a string of poor performances. Many felt that this was the end of the road for the Kolkata Knight Riders skipper, especially with the emergence of Rishabh Pant. On Monday, the selectors announced the Indian team for the upcoming ICC Cricket World Cup. Rather surprisingly, Karthik was named as the backup wicket-keeper ahead of Rishabh Pant due to his ability to handle pressure better. "The situation that was discussed in the selection committee meeting is one of them will play in the XI only if MS Dhoni is injured. Under such circumstances in a crunch match, who is the best guy who can handle the pressure? That is the reason that went in favour of Dinesh Karthik." 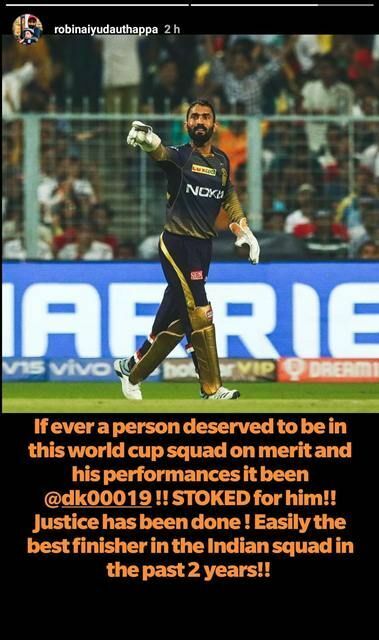 Now, Karthik's KKR teammate Robin Uthappa has taken to Instagram to share his views on DK's selection. Uthappa stated that Karthik had been India's best finisher in the last two years and deserves a place in the World Cup squad. "If ever a person deserved to be in this World Cup squad on merit and his performances it (has) been @dkooo19!! Stoked for him!! Justice has been done. Easily the best finisher in the Indian squad in the past 2 years!!" Uthappa wrote on Instagram. With his spot in the World Cup squad confirmed, Karthik will be eager to hit a purple patch ahead of the marquee event. He has struggled for KKR recently but will back himself to come good sooner rather than later. He has been selected as a back-up keeper in the World Cup squad and will play only if regular keeper MS Dhoni gets injured. What lies in store next for Dinesh Karthik?